I'm enjoying my new place very much. I'm out in the wilderness a little more in an area with some light forests and cornfields so there is a decent amount of wildlife around. We feed birds too so there are a lot in the trees and around the feeders. I took about 1 1/2 hours this afternoon to run around with my camera and see what I could catch. The robin has a nest on the side of the house and the chipmunk is one of at least 3 that frequent the bird feeders. The deer just happened to take off across the field where I could see it, I wasn't even down that way at all. There are a few red-winged blackbirds around the pond especially. You can see one clinging to a reed and another visiting the feeder. The blue-jay was waaaay up in a tree but I still managed to get a descent shot of it. The hummingbird was also around a feeder. The mallard was in the pond that's not far from the house. I was hoping to lure it a little closer with some bread but it was very skittish and took off as soon as I emerged from the treeline. I managed to scare off it's female as well while wandering by the edge of the pond. I hope I didn't disturb them overly much. I took these pictures with my Panasonic Lumix DMC-FZ7. I got it mostly for it's long (12X) optical zoom and stabilizer features precisely for taking pictures like these. I'm not entirely familiar with it still and I forget a lot of the photography knowledge I used to have. I'm looking forward to playing around with it some more. I'm hoping I might get some better shots if I work on blending in a little so I can be physically closer to my subjects. If I really enjoy it I may even invest in a nicer camera some day. 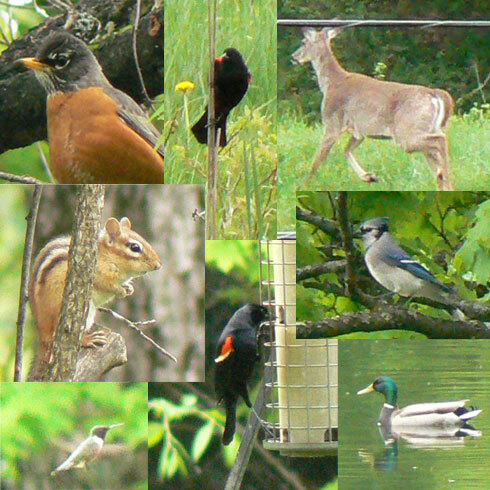 For now it's a great excuse to get outside in the summer and get a little more familiar with the fauna in the area (aka. the yard ;) ).